Thank you for the warm welcome that I have received since arriving at the school at the beginning of December. I am very happy to be here and I am beginning to feel part of the community. I would like to thank all the staff for their hard work this term; I am really looking forward to the next year. I was extremely proud of all the children during the Christ Church Service. They participated well, sitting respectfully through the readings and singing enthusiastically during the carols. The choir were amazing, as good as any school choir that I have heard. I would love to see more children adding to our group of musicians. The children that played the violin and tenor horn performed their pieces well. The piano and flute concert was also well received. If your child is interested in learning to play an instrument, please do let me know. No school Christmas would be complete without a Year R Christmas story and Bumblebees and Ladybirds did not disappoint. They spoke confidently and maintained their concentration really well throughout the play. I have also received very positive comments about the excellent Year 4 Narnia outcome. Well done to all of the children involved throughout the school. On Tuesday we welcomed Mrs Laver to the school. She will be the class teacher in Oak Class from January. All the children involved in the transition afternoon seemed to be enjoying themselves and I hope that they were able to share the experience with you at home. We will continue to support them as they settle into the new routines. Please let me know if there is anything you wish to discuss once your child is back in January. 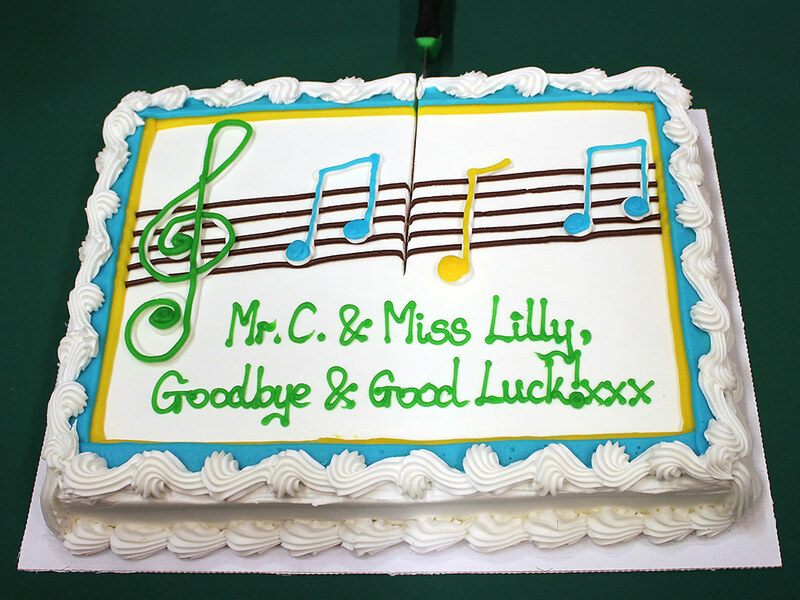 Mr Cascarini and Miss Lilly enjoyed their farewell tea party this week with a very large cake. We are sorry to see them go, but we thank them for their valuable contribution to the school and wish them every success in their future. 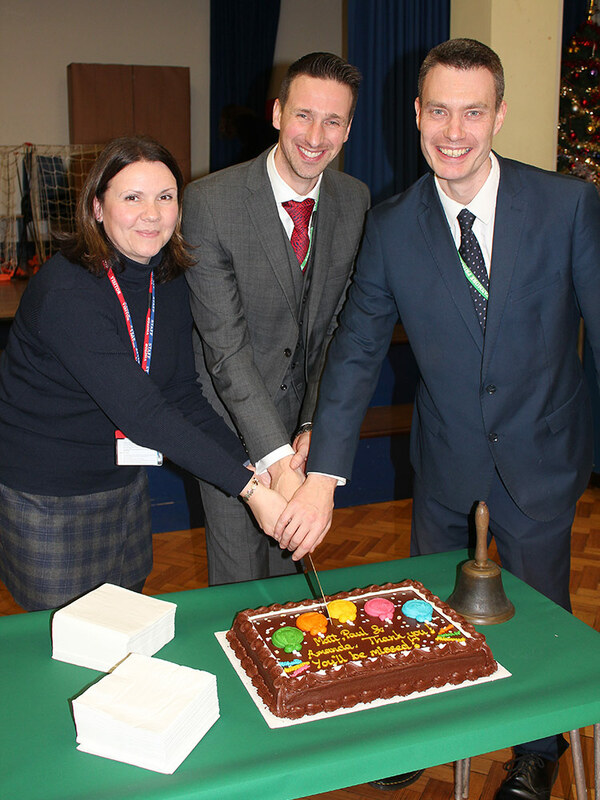 Yesterday, we also said ‘Goodbye’ to Mr Johnson, our Interim Headteacher, Mr Davies, our Consultant Leader, and Mrs Greenwood, SENCo. They have all made a significant contribution to our school improvement journey. We wish them all well. Mrs Fenton will be joining our team in January as the SENco. She is an experienced school leader and has already met with Mrs Greenwood for a handover day. The review meetings that Mrs Greenwood has held with parents will be transferred to Mrs Fenton. Any parent wishing to seek advice about provision for a child with special educational needs should contact Mrs Fenton or Mrs Taylor. I hope that you all have a happy and peaceful Christmas and I look forward to seeing you in the New Year.